A book written by Professor Stephen Cottrell has been recognised with a prestigious award from the American Musical Instrument Society. The Head of City's Department of Music was given the Nicholas Bessaraboff Prize for his 2013 work The Saxophone. According to the society, the annual award is given to a book that furthers the organisation's goal to "promote study of the history, design, and use of musical instruments in all cultures and from all periods". 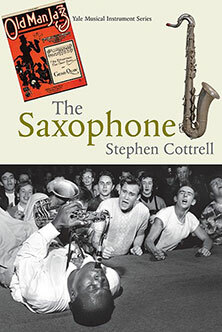 Professor Cottrell's book examines the full social, historical and cultural trajectory of the saxophone, from its invention by Belgian designer Adolphe Sax. The work also considers how and why the instrument, with its idiosyncratic shape and sound, became important for so many music makers around the world. Professor Cottrell said: "I'm delighted by the award of the Bessaraboff Prize from the American Musical Instrument Society. "The award has previously been given to a number of very distinguished scholars in the world of musical instrument scholarship and I am honoured to be placed in their company. "In November 2014, we celebrated the bicentenary of Adolphe Sax's birth, and so it seems doubly appropriate that this award should be associated with the instrument he bequeathed to us, particularly since the saxophone has not always had the best of reputations as the years have gone by." The book was launched in February 2013 at Professor Cottrell's inaugural City lecture.